Supracor's Stimulute Bath Mitt cleans, exfoliates and massages your skin. It needs just a touch of soap to create a foamy lather. Or you can use the Stimulute Bath Mitt dry, brushing your body with upward strokes toward the heart, stimulating the lymph system and releasing the toxins that produce cellulite. 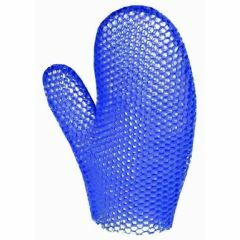 Naturally antifungal and antibacterial, the Supracor Mitt dries quickly and is great for traveling. Simple to Use. Effective. Soothing. makes skin feel clean . Love it so much I ordered two more. Use it everyday in the shower with liquid bath wash. Effective. Simple to Use. Soothing. best priced on this site! Stimulating enough to get blood flowing without hurting. If I am using a skin regimen that is prescription strength w/out the prescription, would it be okay to use the Supracor Spacells Facial Sponge on my face? Yes, you can use this sponge. It is not as rough on the face as you would think.